Triumph persimmons. Note the ripe one, it's much darker. One of the less common fruits that you’ll find at the Redland Organics tent is the Triumph persimmon, the variety that grows well here. It’s a bit smaller than the Fuyu variety you’ll find at the grocery, the kind that’s shaped like a flattened ball. 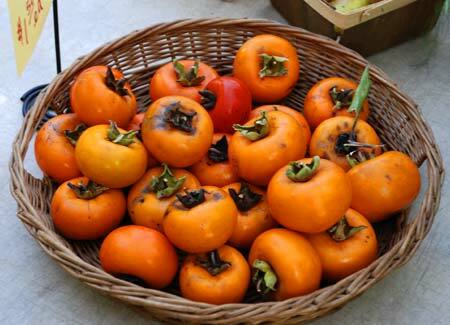 The unripe persimmon is a light shade of orange, but its color darkens to a deep orange as it ripens. Patience is required with this fruit. Unripe, it has a very astringent taste. And, it takes several days to a week for it to ripen. A couple weeks ago I got two persimmons to try out. One ripened in four days, the other took over a week. The orange color grew deeper, and the flesh became quite soft. “Just let it sit on the counter until it turns translucent and looks like orange jello,” Farmer Margie advised. Translucent? Lets light through? Never heard of fruit doing such a thing. Split open a super ripe one, then held it up to the light. Sure enough, light shone through its jelly-like flesh. When ripe, the skin slides right off. Little sacs contain a small seed, which is a bit more translucent and chewy. The persimmon was very sweet, but not overwhelmingly so. Wish I had gotten more! Persimmons are a great snack, and would make a great pudding or mousse, maybe even a pie, along the lines of lemon pie. Bill, over at Tinkering with Dinner, made a persimmon honey ice cream that’s worth trying out. Persimmon season is very short in this area, and is almost over. If you want to experience this interesting fruit, hurry down to the Pinecrest market this Sunday before they’re all gone. Those look like the same sort of persimmons I got at the UM market. I found that a few weeks in the refrigerator instead of a few days on the counter worked just as well for ripening. Great resources! Thanks for sharing, Adiel. I contacted them. They only sell the Fuyu tree. They don’t have the Triumph, unfortunately. Imus, they are sold out of the Triumph variety for this year. Make sure to talk to Erik Tietig from Pine Island Nursery to put you on next years waiting list for the Triumph variety. It is well worth the wait as the Fuyu variety does not do too good in South Florida. Thanks Adiel, I’ll do that.